Recently, I was able ask a few questions to Glass Bottom Games developer, Megan Fox, about their new game, Hot Tin Roof. We first got into the general details and background of the game. Matthew Ahern: Give me the elevator pitch, what is it all about? 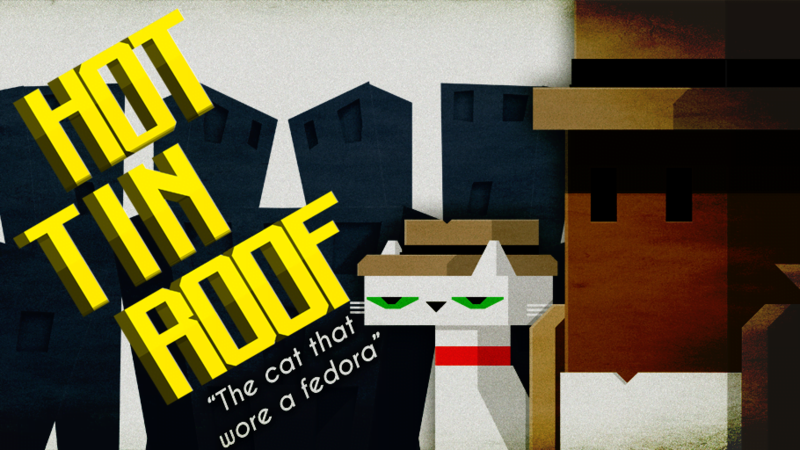 Megan Fox: Hot Tin Roof is kind of a mix of Ultima 7, Metroid, and Zelda. You’ve got your hubworld-style city, from which you branch off into “dungeons” like run-down apartments, canneries, city park, etc. Each of those tends to be gated by one or more abilities you acquire while solving cases, mostly but not always murders – and those abilities take the form of new types of rounds for your revolver. You’ve got grapple rounds, knockbacks (kind of like a rocket jump in a can), gun rounds… but no killing rounds! It’s a noir game, and obviously, Humphrey Bogart doesn’t start a movie by killing 40 dudes. So combat encounters are less about “kill 40 dudes to continue,” and more about – how can I apply all of these weird abilities in a way to disable, disarm, or generally get by everyone and keep finding clues to solve this case I’m on. A: What is the most unique part to Hot Tin Roof? A: The game obviously takes a lot of influence from noir fiction, are there any movies or novels that are its greatest inspiration? F: Blast Of Silence is my topmost favorite noir film of all time, so that’s an obvious influence. In the sphere of games, obviously, we draw some inspiration from Grim Fandango. In terms of novels, I read a ton of mysteries and contemporary fantasy-styled heist-esque stuff – Harry Dresden, Mercy Thompson, Rivers Of London, etc – so all of that doubtless filters back in. A: Now the question has to be asked, what’s with all of the cats? F: I have no idea. The cat was the only model I had time to finish back when I made Jones On Fire for a game jam, and it worked so well there, I just stuck with cats and only cats for that game… and now cats feel right in Hot Tin Roof too. I mean, there’s also rats and pigeons, but even those animals kind of fit into the cat ecosystem (as food, mostly). Someday, I might even add dogs… I’m actually more of a dog person. Next, we got into the specific features of the game. A: Will there be “Side Quests” or is it just a singular narrative? F: Tons of side quests. It’s a bit like Majora’s Mask in that sense. There will be a lot of “if you’re around to witness X event, you’ll realize there’s this whole other thing happening, and you can solve that little side case, earn some goodwill, maybe a reward, etc.” They’ll also come up just from talking to the other people that live in the world, and asking about who they are and what they do. A: How much does combat enter into the game, if at all? F: Heavily, and also not at all. Mooks et al will happily gun for you, but you don’t actually have deadly rounds for your gun – the most you can do is stun them. So when you run into combat encounters, it isn’t “kill 40 dudes to continue,” it’s more about how to apply all these crazy abilities you’ve got to subdue the perps. The game is focused mostly toward exploration and discovery. Combat is used to break that up, not as an omnipresent element. A: Will the game have an economy system? F: It has a system of currency, calls “bits,” you use to purchase certain upgrades, information, health items and the like, etc. You find bits by breaking stuff, basically. A: How big is the gameworld? F: If you’ve ever played Guacamelee, figure something on that order. Big for an indie game, but no where near as huge as Skyrim or whatever. A: How many unique environments are there? A: How many characters can the player interact with in the game? F: A lot. I don’t have an exact number. At least 20ish? A: There are multiple dialog options, will it be possible to have a branching plot based off your dialog choice? F: Yes, there are multiple dialog options, and tons of dialog backstory and side stuff to explore. No, the plot doesn’t branch based on them. This is a non-linear story in how you can choose which areas to hit next and such, but it has a very definite written end to it. A: Will voice acting be included to the dialog between characters? F: Probably not. There will potentially be selective voice acting to set the “feel” of certain key characters, but there will absolutely not be 100% voice acting for dialog. That would be insanely expensive, and really limit the story we could tell. A: Do you guys support gamepads? If so, any ones in particular? F: Everything is designed with gamepads in mind first. We favor the button layouts of XBox 360/PS3 controllers, which is basically the default these days. Finally, we discussed some release and contact information. A: You are planning to release on PC, correct? F: PC/Mac/Linux, correct. Our friends at Cerulean Games are working on a mobile port, though, which should hopefully hit OUYA, GameStick, iOS 7 gamepads, and even touch devices. A: Could Hot Tin Roof make its way to consoles, given the indie friendly attitude as of late? F: Yep. I’d really like to see it on a Sony console. It just depends on how much money we raise, and on whether or not anyone hands us a free devkit. A: When can we expect this to expect this game to come out? F: March-ish 2014. Depends on stretch goals, and you know how release dates are in games – you never know, precisely. A: Where can people find you guys? A: Anything else you want to add? F: Um, I’m a tea drinker? Dunno, heh. What do you guys think? Does this game peak your interest?